A diagram illustrating horizontal integration and contrasting it with vertical integration. Vertical integration and expansion is desired because it secures the supplies needed by the firm to produce its product and the market needed to sell the product. Vertical integration and expansion can become undesirable when its actions become anti-competitive and impede free competition in an open marketplace. Vertical integration is one method of avoiding the hold-up problem. A monopoly produced through vertical integration is called a vertical monopoly. Vertical integration is often closely associated to vertical expansion which, in economics, is the growth of a business enterprise through the acquisition of companies that produce the intermediate goods needed by the business or help market and distribute its product. Such expansion is desired because it secures the supplies needed by the firm to produce its product and the market needed to sell the product. Such expansion can become undesirable when its actions become anti-competitive and impede free competition in an open marketplace. The result is a more efficient business with lower costs and more profits. On the undesirable side, when vertical expansion leads toward monopolistic control of a product or service then regulative action may be required to rectify anti-competitive behavior. Related to vertical expansion is lateral expansion, which is the growth of a business enterprise through the acquisition of similar firms, in the hope of achieving economies of scale. 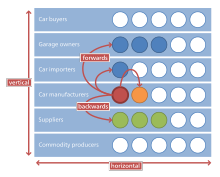 Contrary to horizontal integration, which is a consolidation of many firms that handle the same part of the production process, vertical integration is typified by one firm engaged in different parts of production (e.g., growing raw materials, manufacturing, transporting, marketing, and/or retailing). Vertical integration is the degree to which a firm owns its upstream suppliers and its downstream buyers. There are three varieties of vertical integration: backward (upstream) vertical integration, forward (downstream) vertical integration, and balanced (both upstream and downstream) vertical integration. A company exhibits backward vertical integration when it controls subsidiaries that produce some of the inputs used in the production of its products. For example, an automobile company may own a tire company, a glass company, and a metal company. Control of these three subsidiaries is intended to create a stable supply of inputs and ensure a consistent quality in their final product. It was the main business approach of Ford and other car companies in the 1920s, who sought to minimize costs by integrating the production of cars and car parts, as exemplified in the Ford River Rouge Complex. A company tends toward forward vertical integration when it controls distribution centers and retailers where its products are sold. An example is a brewing company that owns and controls a number of bars or pubs. Disintermediation is a form of vertical integration when purchasing departments take over the former role of wholesalers to source products. There are internal and external society-wide gains and losses stemming from vertical integration, which vary according to the state of technology in the industries involved, roughly corresponding to the stages of the industry lifecycle. [clarification needed] Static technology represents the simplest case, where the gains and losses have been studied extensively. A vertically integrated company usually fails when transactions within the market are too risky or the contracts to support these risks are too costly to administer, such as frequent transactions and a small number of buyers and sellers. Strategic independence (especially if important inputs are rare or highly volatile in price, such as rare-earth metals). During a hunting trip, an American explorer and scientist, Clarence Birdseye, discovered the beneficial effects of "quick-freezing". For example, fish caught a few days previously that were kept in ice remained in perfect condition. In 1924, Clarence Birdseye patented the "Birdseye Plate Froster" and set up the General Seafood Corporation. In 1929, Birdseye's company and the patent were bought by Postum Cereals and the Goldman Sachs Trading Corporation. It later came to be known as General Foods. They kept the same Birdseye name, but it was split into two words (Birds eye) for use as a trademark. Birdseye was paid $20 million for the patents and $2 million for the assets. But until now, Birdseye has faded slowly because they have fixed costs associated with vertical integration, such as property, plants, and equipment that cannot be reduced significantly when production needs decrease. The Birdseye company used vertical integration to create a larger organization structure with more levels of command that produced a slower informational processing rate, with the side effect of making the company so slow, that it couldn't react quickly and didn't take advantages of the growth of supermarkets, until ten years after the competition. The already-developed infrastructure did not allow Birdseye to quickly react to market changes. One of the earliest, largest and most famous examples of vertical integration was the Carnegie Steel company. The company controlled not only the mills where the steel was made, but also the mines where the iron ore was extracted, the coal mines that supplied the coal, the ships that transported the iron ore and the railroads that transported the coal to the factory, the coke ovens where the coal was cooked, etc. The company focused heavily on developing talent internally from the bottom up, rather than importing it from other companies. [full citation needed] Later, Carnegie established an institute of higher learning to teach the steel processes to the next generation. Oil companies, both multinational (such as ExxonMobil, Royal Dutch Shell, ConocoPhillips or BP) and national (e.g., Petronas) often adopt a vertically integrated structure, meaning that they are active along the entire supply chain from locating deposits, drilling and extracting crude oil, transporting it around the world, refining it into petroleum products such as petrol/gasoline, to distributing the fuel to company-owned retail stations, for sale to consumers. Telephone companies in most of the 20th century, especially the largest (the Bell System) were integrated, making their own telephones, telephone cables, telephone exchange equipment and other supplies. From the early 1920s through the early 1950s, the American motion picture had evolved into an industry controlled by a few companies, a condition known as a "mature oligopoly", as it was led by eight major film studios, the most powerful of which were the "Big Five" studios: MGM, Warner Brothers, 20th Century Fox, Paramount Pictures, and RKO. These studios were fully integrated, not only producing and distributing films, but also operating their own movie theaters; the "Little Three", Universal Studios, Columbia Pictures, and United Artists, produced and distributed feature films but did not own theaters. The issue of vertical integration (also known as common ownership) has been the main focus of policy makers because of the possibility of anti-competitive behaviors affiliated with market influence. For example, in United States v. Paramount Pictures, Inc., the Supreme Court ordered the five vertically integrated studios to sell off their theater chains and all trade practices were prohibited (United States v. Paramount Pictures, Inc., 1948). The prevalence of vertical integration wholly predetermined the relationships between both studios and networks[clarification needed] and modified criteria in financing. Networks began arranging content initiated by commonly owned studios and stipulated a portion of the syndication revenues in order for a show to gain a spot on the schedule if it was produced by a studio without common ownership. In response, the studios fundamentally changed the way they made movies and did business. Lacking the financial resources and contract talent they once controlled, the studios now relied on independent producers supplying some portion of the budget in exchange for distribution rights. Certain media conglomerates may, in a similar manner, own television broadcasters (either over-the-air or on cable), production companies that produce content for their networks, and also own the services that distribute their content to viewers (such as television and internet service providers). AT&T, Bell Canada, Comcast, Sky plc, and Rogers Communications are vertically integrated in such a manner—operating media subsidiaries (such as WarnerMedia, Bell Media, NBCUniversal, and Rogers Media), and provide "triple play" services of television, internet, and phone service in some markets (such as Bell TV/Bell Internet, Rogers Cable, Xfinity, and Sky's satellite TV and internet services). Additionally, Bell and Rogers own wireless providers, Bell Mobility and Rogers Wireless, while Comcast is partnered with Verizon Wireless for an Xfinity-branded MVNO. Similarly, Sony has media holdings through its Sony Pictures division, including film and television content, as well as television channels, but is also a manufacturer of consumer electronics that can be used to consume content from itself and others, including televisions, phones, and PlayStation video game consoles. AT&T is the first ever vertical integration where a mobile phone company and a film studio company are under same umbrella. Vertical integration through production and marketing contracts have also become the dominant model for livestock production. Currently, 90% of poultry, 69% of hogs, and 29% of cattle are contractually produced through vertical integration. The USDA supports vertical integration because it has increased food productivity. However, "... contractors receive a large share of farm receipts, formerly assumed to go to the operator's family". Under production contracts, growers raise animals owned by integrators. Farm contracts contain detailed conditions for growers, who are paid based on how efficiently they use feed, provided by the integrator, to raise the animals. The contract dictates how to construct the facilities, how to feed, house, and medicate the animals, and how to handle manure and dispose of carcasses. Generally, the contract also shields the integrator from liability. Jim Hightower, in his book, Eat Your Heart Out, discusses this liability role enacted by large food companies. He finds that in many cases of agricultural vertical integration, the integrator (food company) denies the farmer the right of entrepreneurship. This means that the farmer can only sell under and to the integrator. These restrictions on specified growth, Hightower argues, strips the selling and producing power of the farmer. The producer is ultimately limited by the established standards of the integrator. Yet, at the same time, the integrator still keeps the responsibility connected to the farmer. Hightower sees this as ownership without reliability. Under marketing contracts, growers agree in advance to sell their animals to integrators under an agreed price system. Generally, these contracts shield the integrator from liability for the grower's actions and the only negotiable item is a price. In the United States new automobiles can not be sold at dealerships owned by the same company that produced them but are protected by state franchise laws. Luxottica owns 80% of the market share of companies that produce corrective and protective eyewear as well as owning many retailers, optical departments at Target and Sears, and key eye insurance groups, such as EyeMed. In economic theory, vertical integration has been studied in the literature on incomplete contracts that was developed by Oliver Hart and his coauthors. Consider a seller of an intermediate product that is used by a buyer to produce a final product. The intermediate product can only be produced with the help of specific physical assets (e.g., machines, buildings). Should the buyer own the assets (vertical integration) or should the seller own the assets (non-integration)? Suppose that today the parties have to make relationship-specific investments. Since today complete contracts cannot be written, the two parties will negotiate tomorrow about how to divide the returns of the investments. Since the owner is in a better bargaining position, he will have stronger incentives to invest. Hence, whether vertical integration is desirable or not depends on whose investments are more important. Hart's theory has been extended by several authors. For instance, DeMeza and Lockwood (1998) have studied different bargaining games, while Schmitz (2006) has introduced asymmetric information into the incomplete contracting setup. In these extended models, vertical integration can sometimes be optimal even if only the seller has to make an investment decision. ^ Lazonick, William; David J. Teece (2012). Management Innovation: Essays in the Spirit of Alfred D. Chandler, Jr. OUP Oxford. p. 150. ISBN 0199695687. Retrieved 17 January 2017. ^ Folsom, Burton The Myth of the Robber Barons 5th edition. 2007. pg. 65. ISBN 978-0963020314. "only we can develop ability and hold it in our service. Every year should be marked by the promotion of one or more of our young men." ^ John Alberti (27 November 2014). Screen Ages: A Survey of American Cinema. Routledge. pp. 108–. ISBN 978-1-317-65028-7. ^ Oba, Goro; Chan-Olmstead, Sylvia (2006). "Self-Dealing or Market Transaction? : An Exploratory Study of Vertical Integration in the U.S. Television Syndication Market". Journal of Media Economics. 19 (2): 99–118. doi:10.1207/s15327736me1902_2. ^ McDonald, P. & Wasko, J. (2008). The Contemporary Hollywood Film Industry. Australia: Blackwell Publishing Ltd. pp. 14–17. ISBN 9781405133876. ^ "USDA ERS - Farmers' Use of Marketing and Production Contracts". Ers.usda.gov. Retrieved 24 April 2015. ^ Eat Your Heart Out: Food Profiteering in America - Jim Hightower - Google Books. Books.google.com. 21 October 2009. Retrieved 24 April 2015. ^ Surowiecki, James (4 September 2006). "Dealer's Choice". The New Yorker. Retrieved 1 October 2016. ^ Goodman, Andrew (16 July 2014). "There's More to Ray-Ban and Oakley Than Meets the Eye". Forbes. Retrieved 1 October 2016. ^ Swanson, Ana (10 September 2014). "Meet the Four-Eyed, Eight-Tentacled Monopoly That is Making Your Glasses So Expensive". Forbes. Retrieved 1 October 2016. ^ Grossman, Sanford J.; Hart, Oliver D. (1986). "The Costs and Benefits of Ownership: A Theory of Vertical and Lateral Integration". Journal of Political Economy. 94 (4): 691–719. doi:10.1086/261404. ISSN 0022-3808. ^ Hart, Oliver; Moore, John (1990). "Property Rights and the Nature of the Firm". Journal of Political Economy. 98 (6): 1119–1158. doi:10.1086/261729. ISSN 0022-3808. ^ de Meza, D.; Lockwood, B. (1998). "Does Asset Ownership Always Motivate Managers? Outside Options and the Property Rights Theory of the Firm". The Quarterly Journal of Economics. 113 (2): 361–386. doi:10.1162/003355398555621. ISSN 0033-5533. ^ Schmitz, Patrick W. (2006). "Information Gathering, Transaction Costs, and the Property Rights Approach". American Economic Review. 96 (1): 422–434. Kathryn H. (1986). "Matching Vertical Integration strategies". Strategic Management Journal. 7: 535–555. doi:10.1002/smj.4250070605. Matthew Lewis (2013). "On Apple And Vertical Integration". Retrieved 11 April 2015. Paul Cole-Ingait; Demand Media (2013). "Vertical Integration Examples in the Smartphone Industry". Retrieved 11 April 2015. Robert D. Buzzell. "Is Vertical Integration Profitable?". Retrieved 11 April 2015. Wharton (2012). "How Apple Made 'Vertical Integration' Hot Again — Too Hot, Maybe". Retrieved 13 April 2015. "Idea Vertical Integration". 30 March 2009. Retrieved 12 April 2015. Grossman SJ, Hart OD (1986). "The costs and benefits of ownership: A theory of vertical and lateral integration" (PDF). The Journal of Political Economy: 691–719. doi:10.1086/261404. "Iglo History". Archived from the original on 3 May 2015. Retrieved 2 May 2015. Bramwell G. Rudd, 2014, "Courtaulds and the Hosiery & Knitwear Industry," Lancaster, PA:Carnegie. Joseph R. Conlin, 2007, "Vertical Integration," in The American Past: A Survey of American History, p. 457, Belmont, CA:Thompson Wadsworth.